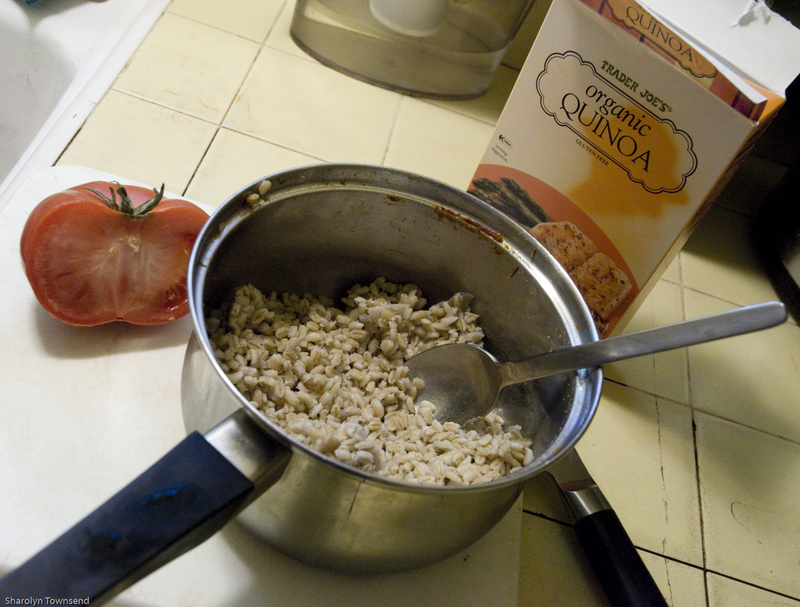 This is what I had in the fridge: Pearl Barley from the previous night’s BBQ, a half tomato and 1/3 of a box of quinoa. I set the quinoa to cooking. 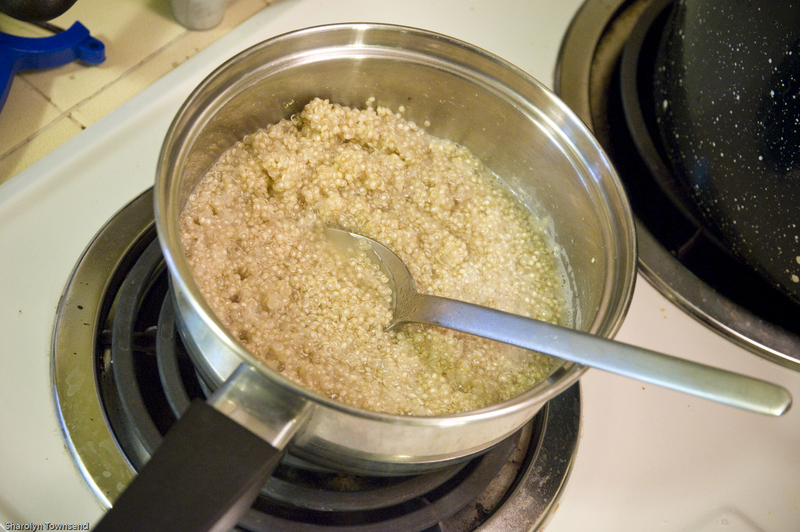 I’ve seen it prepared other ways, but my way is to rinse the quinoa several times to make sure of no gritty chunks ( I lose some grains in the process since they are so dang tiny), then bring water to a boil and put the quinoa in. 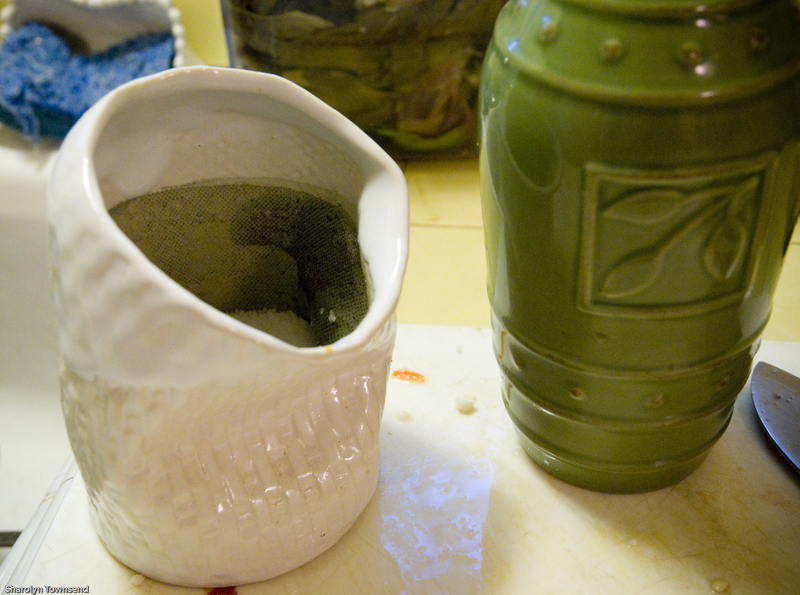 When it comes to a second boil, stir and then leave it on low until all the water has evaporated. Pretty much exactly as one would prepare rice (though I’ve seen other methods of rice making as well that go against all my asian roots and makes me cringe). 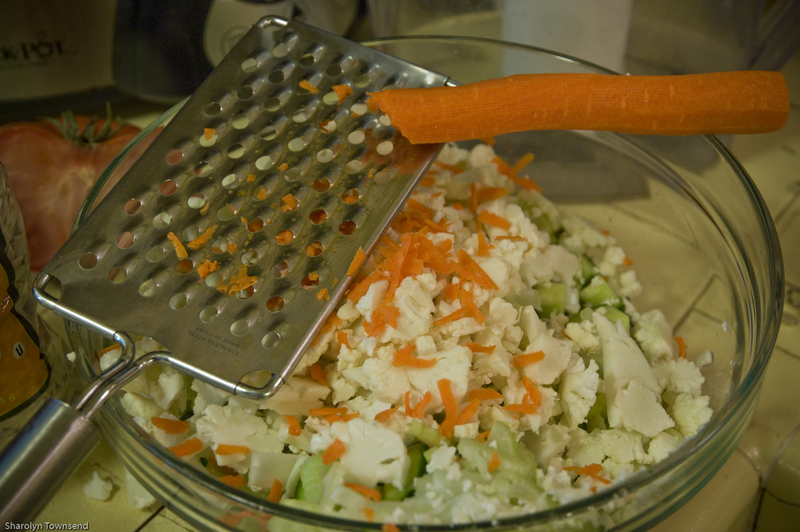 Then comes the chopping and the grating. I happened to have the veggies that I had, but that in no way should limit you. As long as you have crunchy veggies, this dish will be a success. I happen to like the texture of cucumber and cauliflower in salads and was lucky enough to have them in my fridge at the time. Sorry folks, I’m kind of a pinch of this and that cook. As you will see later, I’m not much for measuring and I rarely follow recipes. I’d say I had approximately a cup of barley and a cup of quinoa. My personal preference is to grate the carrot into the salad. Easier to chew and it seems to absorb more of the yummy dressing in this state. Oh yes! 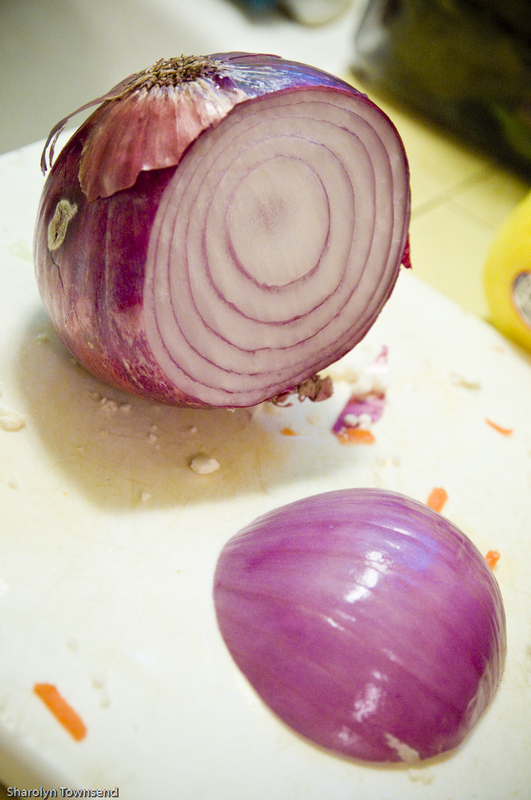 And a wee bit of red onion finely sliced or diced. I took a pic to illustrate how little I use. Too much and it overwhelms the salad and also makes for dragon breath that will haunt you for the rest of the night and maybe into the morning! Don’t forget that this is a wonderful time to fill your compost. 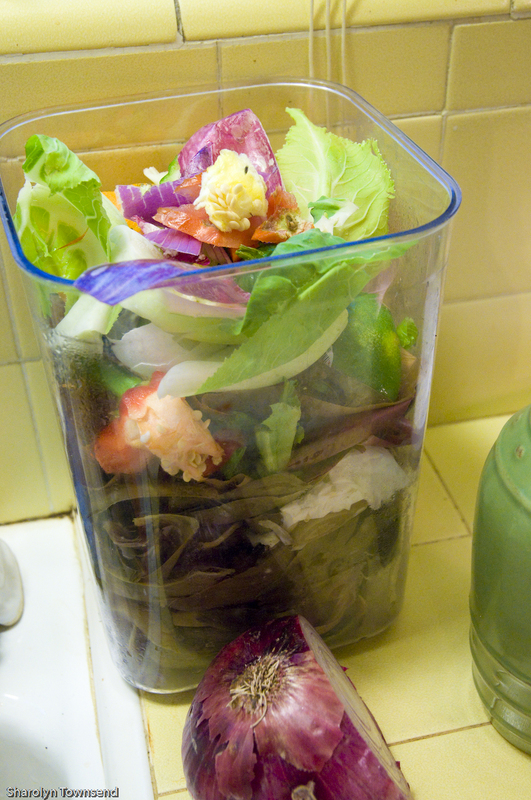 If you do not yet have a compost, get on it! It’s absolutely brilliant. It took me a while to convince my hubby that we needed one. He thought it would just attract wildlife i.e. rats and our yard was too small. But I worked on him and we ended up building a small one. He is now a convert. It makes fabulous soil for our little garden, and it feels lovely not tossing all this organic matter into the landfill. *Side note, the best compost bucket in the world is not the ones they sell specifically for compost but this plastic OXO brand container. It is marketed as a container for pantry items like cereal, etc. because the lid has a top button that you depress and it seals the container. Well, it absolutely works as a compost bucket for exactly that reason: it seals. No smelly fumes emerging into the kitchen AND it’s easy to clean unlike traditional buckets that have all sorts of inconvenient grooves for stink to settle into. Okay, back to the salad. As I mentioned earlier I’m not a measurer and as a result I invariably realize mid-way that I have chosen a vessel too small for what I am creating. Since I am a salad monster, I should have known better and just gone for the largest bowl possible. But for me, starting smaller helps to reign me back a bit. 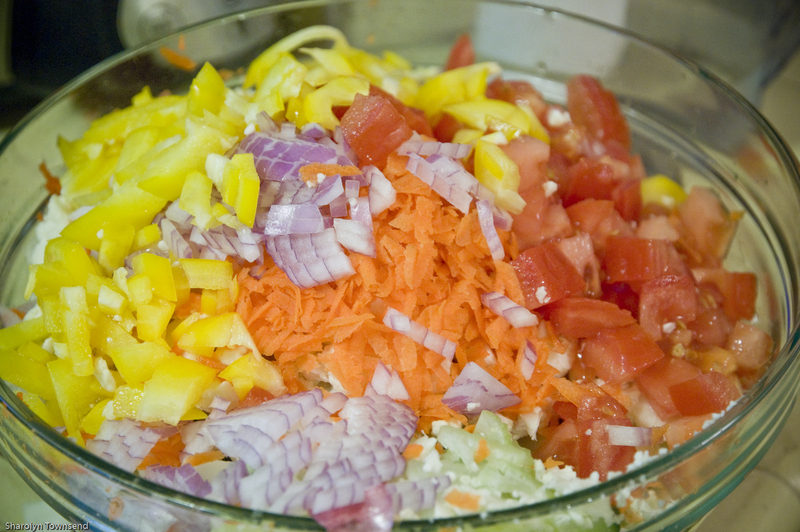 It is always helpful to have a bowl that is slightly too large so that when you get to the dressing it part of the process, you can easily mix without all the ingredients falling out. 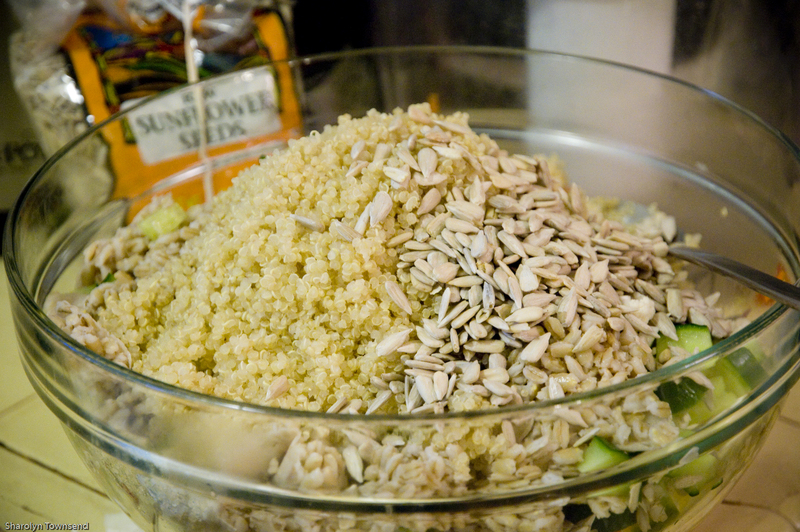 Last but not least, when all fresh veg are happily sitting in the bowl, toss the cooked quinoa and some raw sunflower seeds (optional) on top. 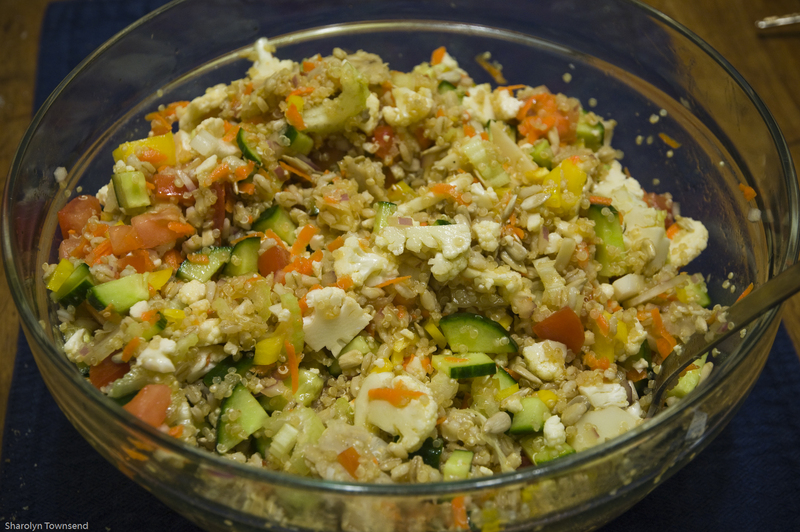 The quinoa is still warm from cooking, but as it mixes in quickly gets cooled by the veg. 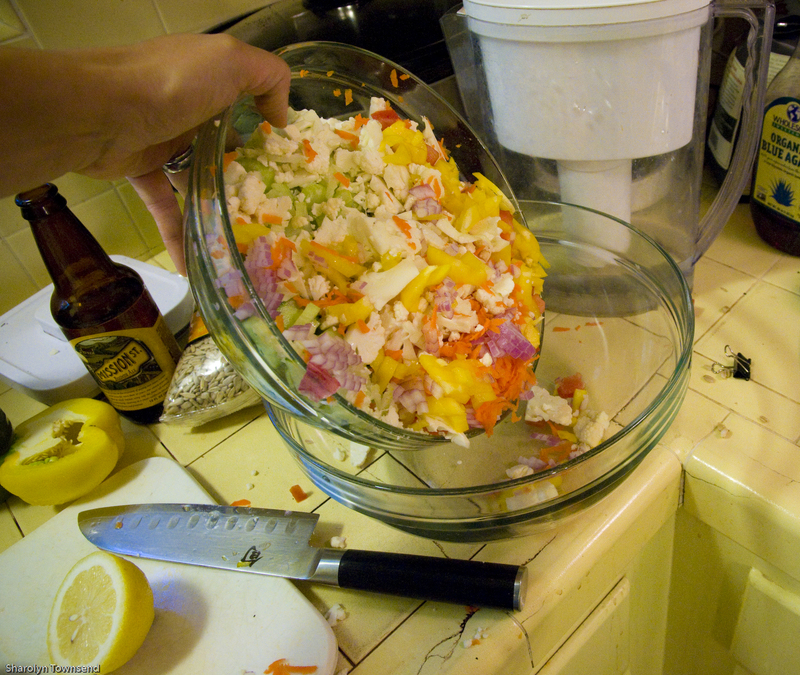 And now for the dressing. Remember, keep it simple my geniuses. If you have a favourite salad dressing in the fridge, good for you! Toss it in. 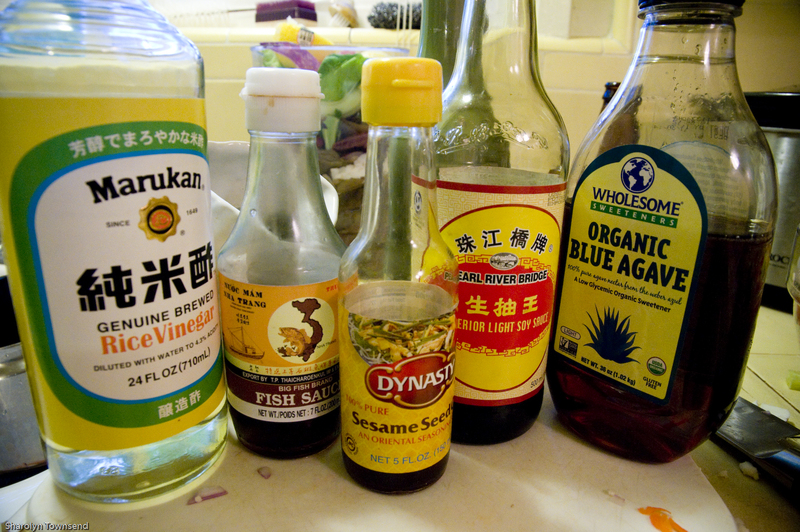 If you like making your own dressing, do so and toss it in. 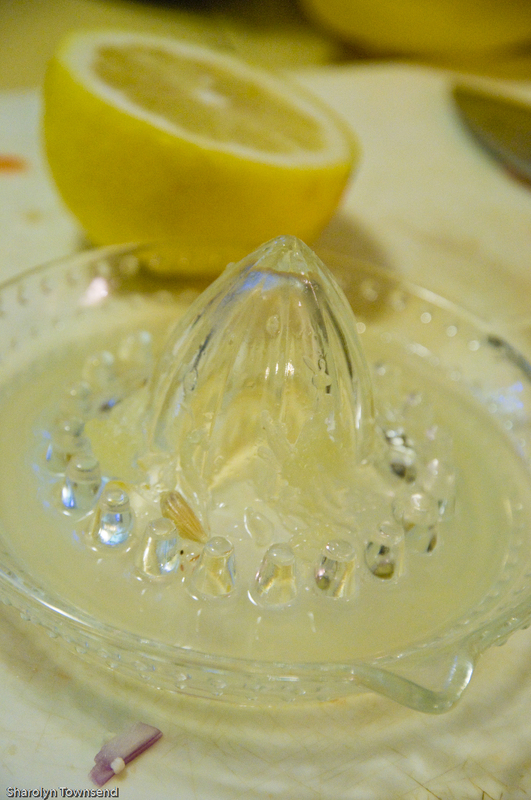 I am a sour/vinegar fan and so I favour this totally made up recipe of mine, which I will now attempt to share but keep in mind the measurements are approximations. Keep the phrase “to taste” in mind and make adjustments accordingly. My salad was rather large so measurements are also large. 1 dash kosher (or any) salt. Celtic sea salt would be awesome! It wouldn’t hurt to sprinkle liberally with sesame seeds as well. I know my Auntie R would approve. A salad even my hubby can enjoy. 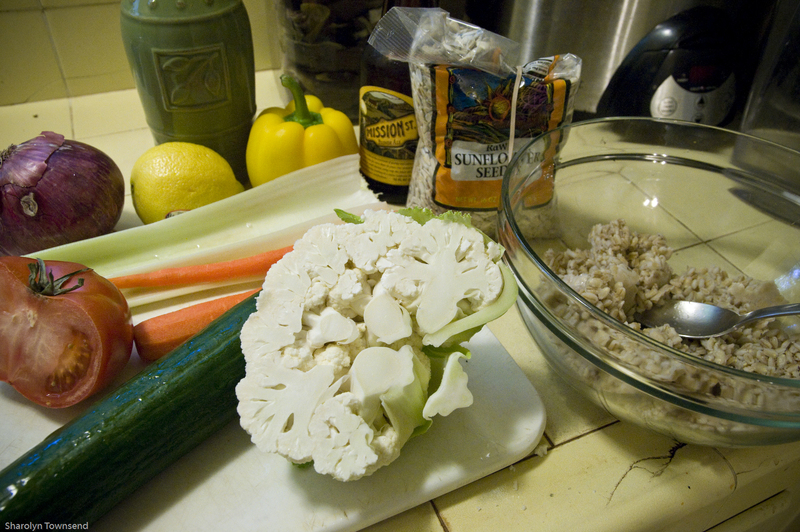 For me, the essential ingredients are those that give it a variety of texture: the cauliflower, sunflower seeds and grain. I’ve never used pearl barley before, but it was very nice. In lieu of that, brown rice or spelt would do…any grain you enjoy. So, I hope you give this a try. It’s super simple (any and all ingredients can be substituted with something similar) and pretty quick so long as you don’t mind a little chopping. Wow, I’m so glad my little competition inspired you to whip this up! It looks great and I too am one of those cooks who does everything by site, but my blog has forced me to be more exact 🙂 Great job and thanks again!